Adventure drama adapted from Robert Louis Stevenson's classic novel. Adventure drama adapted from Robert Louis Stevenson's classic novel. Jim Hawkins (Kim Burfield) is a young man who works at a pub with his mother (Maria Rohm). When a drunken old sailor Billy Bones (Lionel Stander) comes in for a drink and dies, Jim gets his hands on an old pirate's treasure map. He then enlists Squire Trelawney (Walter Slezak) and Dr. Livesey (Angel del Pozo) to help him locate the island on the map. Orson Welles stars as Long John Silver, a pirate Jim meets on his travels. Jim Hawkins (Kim Burfield) is a young man who works at a pub with his mother (Maria Rohm). When a drunken old sailor Billy Bones (Lionel Stander) comes in for a drink and dies, Jim gets his hands on an old pirate's treasure map. He then enlists Squire Trelawney (Walter Slezak) and Dr. Livesey (Angel del Pozo) to help him locate the island on the map. 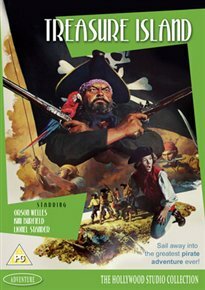 Orson Welles stars as Long John Silver, a pirate Jim meets on his travels.